The vibrant Texan city of Austin has been ranked the best American state capital to live in, thanks in large part to its economic strength and high-quality healthcare. Jackson, Mississippi, was ranked the country’s least desirable state capital to live in, due primarily to abysmal quality-of-life rankings. In many cases, the health of cities’ real estate markets correlate with their livability rankings. Austin, Texas, is world renowned for its thriving cultural scene and world-class dining. And now it has another superlative to add to its list of achievements: Best American state capital to live in. Personal finance site WalletHub compiled a ranking of the best and worst state capitals to live in, basing their conclusions on 42 key indicators, ranging from affordability to coffee shops per capita. The indicators were dispersed among four major categories: affordability, economic well-being, quality of education and health and quality of life. Austin boasts the lowest premature death rate as well as the lowest infant mortality rate. It also tied with Denver, Colorado for the largest percentage of millennial newcomers. It ranked second among the nation’s capitals with respect to economic well-being, which included such indicators as foreclosure rates, population growth, average credit scores and income inequality. It also came in third in terms of offering the most attractions. In WalletHub’s 2016 report on the nation’s best real estate markets, Austin came in fifth overall. It was also ranked America’s eighth most recession-recovered city in another recent WalletHub study. 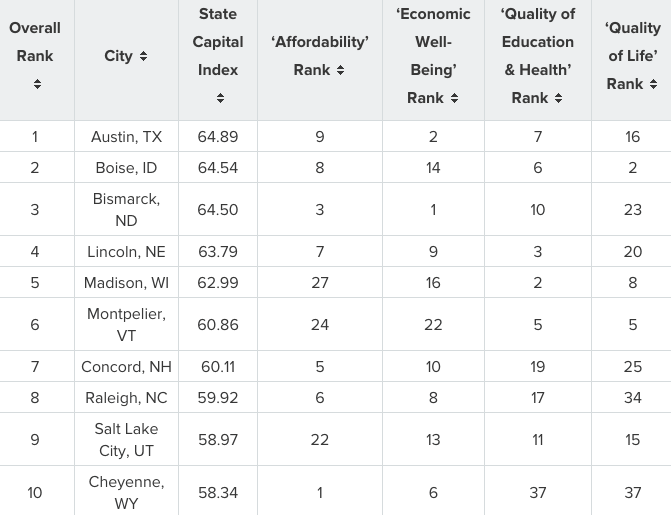 Other honorable mentions from the top 10 list include Bismarck, North Dakota, which ranks first in the nation with respect to economic well-being; Cheyenne, Wyoming, which ranks first for affordability; Boise, Idaho, which ranks second with respect to quality of life; and Madison, Wisconsin, which ranks first for quality of education and health. Of the top 10 cities included in the state capital ranking, all that were included in WalletHub’s 2016 real estate market ranking fell within the top 40 of the 300 ranked cities. Jackson, Mississippi ranked second-to-last among the state capitals with respect to quality of life, which includes such indicators as violent and property crime rates, nightlife options per capita, traffic congestion and walkability. It ranked last in the nation in terms of the percentage of millennial newcomers. Of the 300 U.S. cities included in WalletHub’s 2016 ranking of the country’s real estate markets, Jackson ranked 297th with respect to affordability and its economic environment. Its real estate market ranked 191th. Hartford, Connecticut received the lowest rankings in three categories: lowest median household income, highest unemployment rate and highest percentage of population living in poverty. Hartford’s real estate market was ranked 286th of 300 in WalletHub’s 2016 ranking. Trenton, New Jersey was identified as the state capital with the lowest percentage of adults who hold a Bachelor’s degree or higher, and ranked last with respect to economic well-being. Little Rock, Arkansas boasts the highest crime rate, according to the study. Of the bottom 10 cities listed in the state capital ranking, all that were included in the 2016 real estate market ranking fell within the bottom half. Ingrid Burke is the international editor at Tranio.com, an international real estate broker with a dedicated and independent team of journalists and real estate investment experts.